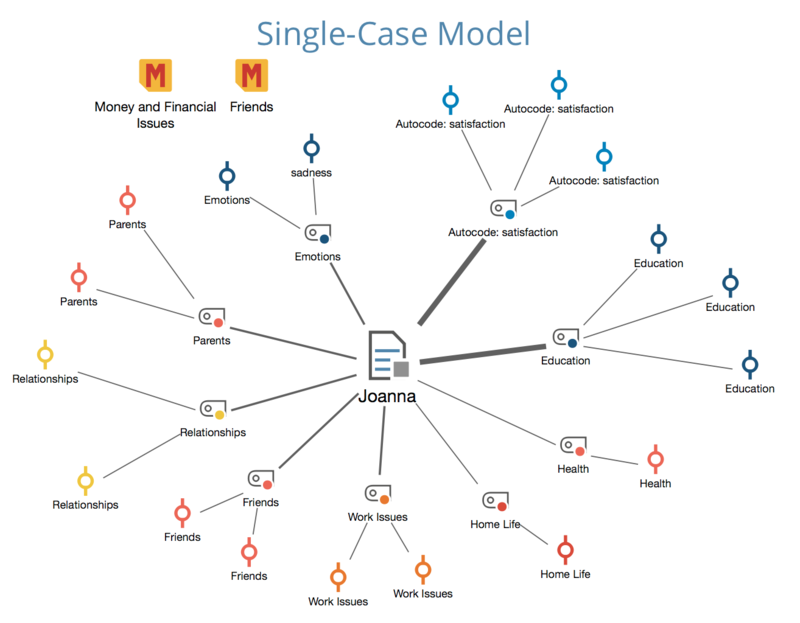 In this model, a case from the “Document System” is at the center of the analysis (Document, Document Group or Document Set). After selecting the model from the menu, the caseto be analyzed is dragged onto the MAXMaps workspace. The purpose of the visualization is to make the memos, codes, and code segments for the selected case accessible. The elements of the model will be displayed in the map with the document in the middle of the workspace and the other elements arranged in a star pattern around it. If memos are included, they are positioned at the top of the map. The various elements are connected to the text by lines with seven levels of thickness. The thickness of each line is defined by the number of text segments coded with the particular code – the thicker the line, the higher the number of coded segments. It could be that in some cases a text has dozens and dozens of codes or memos, or that a very high number of text segments were coded. For this reason, you have the option of setting a maximum number of codes, memos, and text segments to be displayed, as well as the option of changing the exact search criteria. Once you have created an individual case model via the New Model menu in the Start tab, drag a document, document group, or document set from your “Document System” into the map. Memos associated with the case or associated code. Codes associated with the case. Segments from this case associated with the codes shown. Codes that are used in the selected document. Segments that have been coded with the codes from point 2. 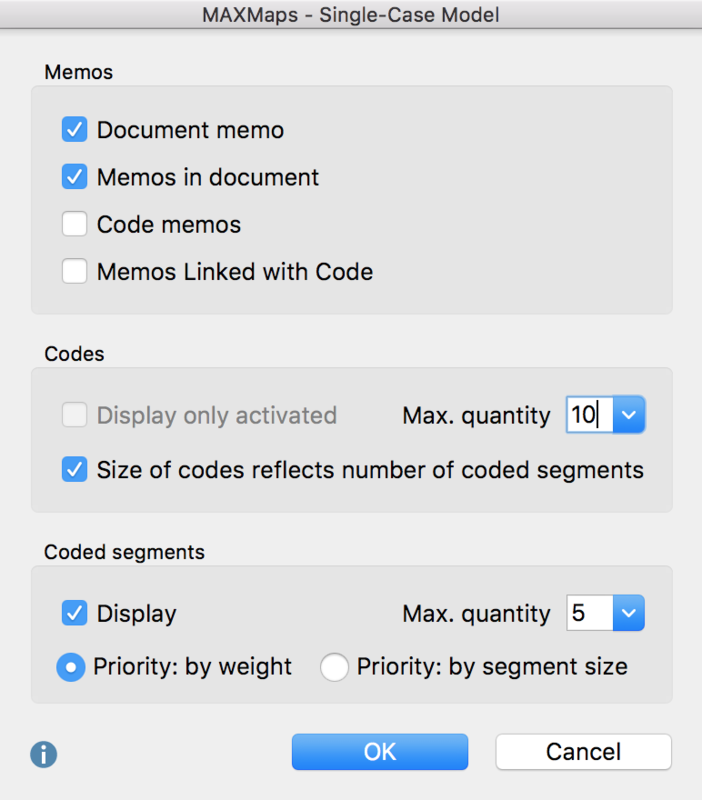 Memos – Here you can select each memo type to be included in the map: Document memos, Memos in document, code memos, Memos linked with code. Display only activated – Only those codes are displayed that you already activated in the “Code System” window. Max. quantity (5, 10, 15, 20) – Limits the number of codes to be displayed in the map. If fewer codes are to be displayed than are assigned to the case, a ranking is created according to the number of existing coded segments, that is, the codes with the most segments are displayed, of course only with respect to the case chosen for the model. Size … number of coded segments – Select this option to display codes with many coded segments as larger than those with few segments. MAXMap uses three different sizes for code representation: codes whose frequencies are in the range of one standard deviation around the mean are displayed in a medium size. Codes with more or less coded segments get a bigger or smaller symbol. If the code frequencies are close together, MAXMaps uses only the smallest or smallest together with the average symbol size. Display – If this option is on, an adjustable number of associated coded segments are displayed for each code, providing a visual representation of the code frequency. In the event that the code has more than the maximum number of desired codes, you can choose either priority by weight (larger weight codings have priority) or priority by segment size (larger area codes have priority).